Maximize your comfort zone by lounging under the large canopy of the Galtech 11 x 8 ft. Oval Patio Umbrella. 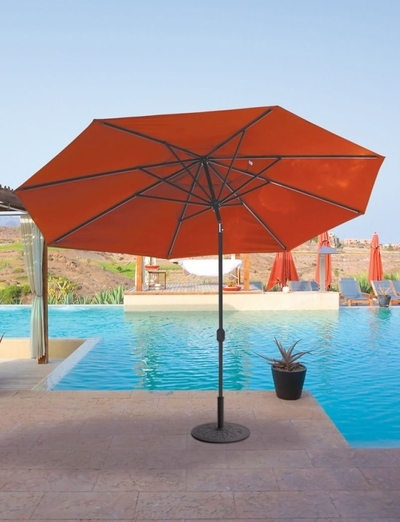 Perfect for use with a sizable dining table, this outdoor umbrella offers spacious shade. The aluminum pole is available in several powder-coated finishes, and it features a solid resin hub and finial for extra durability. Tilt the shade to any angle increasing your protection as the sun moves throughout the day. With its fade-resistant premium fabrics there is sure to be one to match your outdoor decor perfectly. This umbrella includes a crank lift so opening is a breeze thanks to its crank lift. Add that final touch of flair to your open-air space this season with this luxurious patio umbrella. * Shade Size: 8 x 11 ft.
Freight: Our shipping costs for most items are based on each items size and weight. We strive to provide you with the most competitive shipping costs possible. All orders are shipped FOB Michigan or container destination. Unless a specific carrier is requested by the customer, all shipments will be routed at the discretion of Open Air Lifestyles. We may choose to deliver via container direct to certain areas based on the size of the order. Customer is responsible for ALL freight charges. Most new orders are shipped between 4-8 weeks.